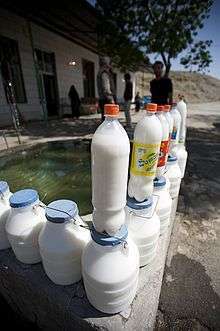 Doogh, Ayran or Tan (Persian: دوغ‎‎, Azerbaijani: ayran, Armenian: թան tan, Arabic: شنينة shinēna Turkish: ayran) is a savory yogurt-based beverage. Doogh is the same drink known in Turkey as ayran.. It is popular in Iran, Turkey, Azerbaijan, Armenia, Kazakhstan, Kyrgystan, North Caucasus, the Balkans, Afghanistan (by the Kirghiz) and Lebanon. It is made by mixing yoghurt and chilled or iced water and has been variously described as "diluted yogurt". It is sometimes carbonated and seasoned with mint. According to Nevin Halici, ayran is a traditional Turkish drink and was consumed by nomadic Turks prior to 1000 CE. According to Celalettin Koçak and Yahya Kemal Avsar (Professor of Food Engineering at Mustafa Kemal University), ayran was first developed thousands of years ago by the Göktürks, who would dilute bitter yogurt with water in an attempt to improve its flavor. A c. 1000 CE Turkish dictionary, Dīwān ul-Lughat al-Turk, defines ayran as a "drink made out of milk." Recep Tayyip Erdoğan, a Turkish politician who has held the posts of President and Prime Minister, has promoted ayran as a national drink. Speaking at a 2013 WHO Global Alcohol Policy Conference held in İstanbul, Erdoğan contrasted ayran with alcohol, which he suggested was a recent introduction to Turkey. Stating that in the early years of the modern Turkish republic (c. 1920-1950), alcoholic beverages were "part of the radical top-down modernization program embarked upon by the elites," Erdoğan expressed regret that alcohol was widely promoted during this period even in school textbooks. Still, sales of ayran in Turkey may lag behind other non-alcoholic beverages. According to a 2015 joint statement from the Soft Drink Producers Association, the Sparkling Water Producers Association, and the Milk Producers and Exporters Union of Turkey, ayran consumption during the holy month of Ramadan has declined every year for the years 2010-15. In 2015, Turkey’s Customs and Trade Ministry imposed a 220,000 Turkish Lira fine (approx. $70,000) to state-owned Çaykur manufacturers for “insulting ayran” in one of their advertisement for iced tea, in which the protagonist raps that ayran makes him sleepy, and halted advertisements of Çaykur's competing, ice-tea product. Salt (and sometimes pepper) is added, and dried mint or pennyroyal can be mixed in as well. One variation includes diced cucumbers to provide a crunchy texture to the beverage. Some varieties of doogh have carbonation. 1 2 3 Halici, Nevin (27 April 2013). "Turkish Delights". Gastronomica: The Journal of Critical Food Studies. University of California Press. 1 (1): 92–93. ↑ Yildiz Fatih (2010). Development and Manufacture of Yogurt and Other Functional Dairy Products. CRC Press. p. 10. ISBN 9781420082081. ↑ Smih, Sebastian (2006). Allah's Mountains: The Battle for Chechnya. Tauris Parke Paperbacks. p. 25. ISBN 9781850439790. ↑ Leslie Strnadel, Patrick Erdley (2012). Bulgaria (Other Places Travel Guide). Other Places Publishing. p. 58. ISBN 9780982261996. ↑ Nazif Shahrani, M. (2013). The Kirghiz and Wakhi of Afghanistan. 9780295803784: University of Washington Press. pp. 92–93. ↑ A. Y. Tamime (ed.) (2008). Fermented Milks. John Wiley & Sons. p. 96. ISBN 9781405172387. 1 2 Islamic Republic of Iran (26–29 January 2009). Project Document for a Regional Standard for Doogh (CX/NEA 09/5/8) (PDF). Tunis, Tunisia: United Nations. Joint FAO/WHO food standards programme of the FAO/WHO coordinating committee for the Near East. Retrieved 26 June 2011. ↑ Simmons, Shirin (2007). Treasury of Persian Cuisine. Stamford House Publishing. ISBN 1-904985-56-4. ↑ Grosart, Alexander (17 July 1886). "Soor-doock" and "doogh". The Academy and literature. 30. Blackburn. p. 59. ↑ "Ayran". Etimoloji Turkce (in Turkish). Tehlif Hakları. Retrieved 31 August 2014. 1 2 3 "PM says Turkey's national drink is ayran, not beer". Zaman. 27 April 2013. 1 2 "Turks turn away from 'national drink' despite Erdoğan". Zaman. 22 June 2015. 1 2 Çelikkan, Erdinç (9 November 2015). "State-owned tea firm fined 220,000 liras for 'insulting ayran' in ads". Hürriyet.